To report the light- and dark-adapted perimetric findings in a patient with multiple evanescent white dot syndrome (MEWDS). The patient was a 25-year-old Japanese woman who underwent comprehensive ophthalmological examinations including measurements of the visual acuity, dilated ophthalmoscopy, Goldmann kinetic perimetry, electroretinography (ERG), indocyanine green fundus angiography (ICGA), and optical coherence tomography (OCT). Kinetic perimetry was performed under light- and dark-adapted conditions. The patient was diagnosed with MEWDS by the fundus and visual field findings, and the ICGA abnormalities. Light-adapted perimetry showed an enlargement of the blind spot; however, the size of the blind spot was normalized with dark-adaptation. Amplitude of cone ERG was more reduced than that of rod ERG in the affected eye. The OCT images showed multiple disruptions of the ellipsoid and interdigitation zones. These abnormalities were still present 9 months after the onset although the fundus appeared normal. These findings indicate a persistent cone-dominated dysfunction in a patient with MEWDS. The authors express gratitude to Miyuki Oosato M.D. of Oosato Eye Clinic who referred the patient to our clinic, and Kazuyo Nakada-Omure C.O. 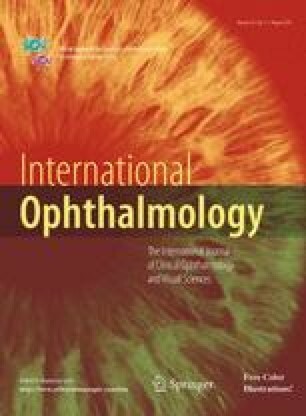 of Department of Ophthalmology, Kinki University Faculty of Medicine for her technical assistance, and Professor Duco I. Hamasaki of the Bascom Palmer Eye Institute of the University of Miami for critical discussions and final manuscript editing. This research was supported by the research grants to SK from Japan Society for the Promotion of Science, Japan (26462654). The authors have no proprietary interest in any aspect of this report.